Following are ten useful resources that can help you get the most out of your BeagleBone. The list starts with tips on getting started with digital electronics — where to buy the required tools and components. You can get electronic components for your projects in quite a few places. Components such as resistors, light-emitting diodes (LEDs), potentiometers, and motors are quite standard, and any electronics store should have them. Naturally, you can go for starter kits that feature many other useful tools and components, such as wire-cutting and wire-stripping pliers; equipment wires; and a soldering iron, stand, and glasses. The type of starter kit you get depends on how far you want to go on your electronics trip. 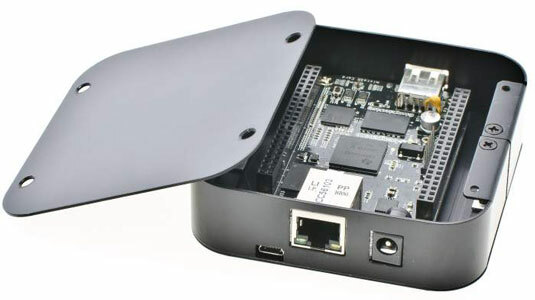 You can also find BeagleBone Black starter kits. These kits feature a BeagleBone Black and some useful components and capes to go with it. You can get BeagleBone Black starter kits from Adafruit and Logic Supply. A case features slots that let you access both headers as well as the USB ports, power jack, Ethernet jack, power buttons, Micro HDMI jack, and microSD card. All the USR (user) LEDs are visible with your BeagleBone inside it. Covers feature feet for mounting the board in slide-in wall slots and vents for keeping the board cool. Also, a nice cover looks pretty neat, and most covers are relatively inexpensive. Be on the lookout for nearby events and workshops, which cover all kinds of topics: robotics, sensor networks, mobile communications, home automation, and pretty much anything else you can imagine. Getting together with other electronics enthusiasts gives you a chance to have fun and get some knowledge from others. You can see some really cool projects or even go ahead and present your own (and there’s also the possibility of free food and coffee). Universities and schools often hold such events, and there are many independent events, such as the popular Maker Faire and the events held by Hackaday. If you ever have the opportunity to attend a Maker Faire or Hackaday event, we highly recommend the experience! The BeagleBoard community is a welcoming, active, and open group of people with a common interest. The site includes a blog, a live chat, forums, and videos featuring all kinds of tinkering, hacking, and developing. The BeagleBoard community loves helping new users, but before asking something, there are a few good practices that you should follow. Asking the same questions over and over again, especially if you can find answers with just a couple of clicks or an online search, is considered rude. You should always try to get answers on your own before posting online. Rooting out a problem without relying on others helps you gain more insight into digital electronics and the BeagleBone. Plus, if you have a simple problem that could have been solved by a few minutes of troubleshooting or an online search, the community may consider it rude that you posted the question to the group. You can visit BeagleBone FAQs for a collection of some of the most frequently asked questions. If you believe that your project is pretty neat, there are bound to be other people who think the same thing about it. You can find those people by posting your project online. The Internet is a great asset for us electronics and computing enthusiasts. There are plenty of websites that can help you to share your project. When you post your project, you can provide step-by-step instructions and images so that others can try it. You’ll receive comments — both good and bad — and some people will ask questions or offer suggestions. Sharing a project isn’t just about letting others see it. It’s also about getting advice from other people and improving it with the help of everyone. Electricity works at an atomic level. Many things are happening inside your circuits that you just can’t see and can hardly visualize. Sure, you have knowledge to back you up, but an LED can burn out just because you forget to put a resistor in series with it. Your BeagleBone might even be severely damaged by a short circuit caused by two random wires that you didn’t even notice were 5V and GND. Failing is often annoying, especially when you can’t figure out why something didn’t work. But the good thing about failing is that if you can root out the issue, you have gained more knowledge than you would have if you’d succeeded on your first try. Failing enables you to gain insight into how the electrical world works. Failing means that you tried. Whenever you fail, don’t just throw the project away and start over: try to understand the problem, find a solution, and come up with an explanation based on what you observed. You should try out the projects that interest you most. These can also spark your imagination to create something of your own. You may even want to figure out how to program the BeagleBone by using programming languages other than BoneScript and Python.